Symbols of Jiangsu (Pocket Edition) selects the most representative and symbolic Jiangsu special cultural resources, via Chinese-English booklets with picture and literature explaining the profound in simple language, to analyze the connotation of the past and the present, to illustrate the richness of Jiangsu's cultural humanity, to expand Jiangsu's cultural influence and to form Jiangsu's cultural brand. Through brief language and refined pictures of different symbols, the booklets compendiously introduce each Jiangsu symbol's origin, development, current situation and unique cultural value. By combining storytelling and practicability, these booklets may allow Chinese and foreign readers to quickly have a broad and general knowledge of Jiangsu's symbols and to acquire further information on each symbol. The booklets are designed by famous book designer, bound in an internationally popular pocket size in accordance with the aesthetic needs of international readers and blended with every symbol's meaning. 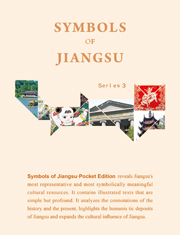 The booklets are printed in full color and can be seen as portable "introduction of Jiangsu's symbol". Author: Han Wenning et al.